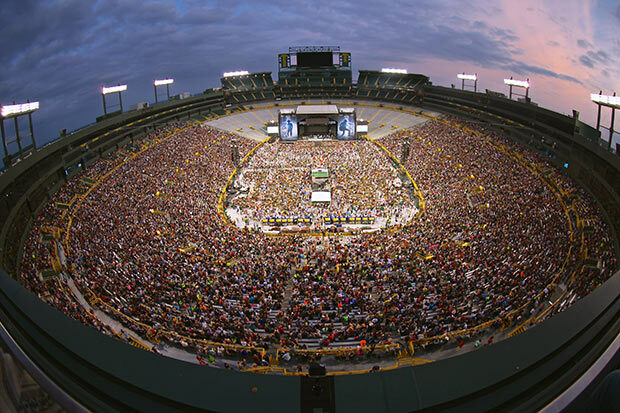 GREEN BAY, Wis. (June 21, 2015) — The flooring and stage started being built Monday… The traffic advisories began Wednesday… When Kenny Chesney rolled into historic Lambeau Field Saturday, June 20, Green Bay was more than ready for the man The Wall Street Journal hailed as “The King of the Road” and his The Big Revival Tour. The second time he’s taken over the historic home of the Green Bay Packers proved to be an unforgettable evening. Over 24 songs, Chesney brought the crowd to threshold after threshold, celebrating life as it’s lived in the flyover and the power of loving where you making every moment count. From the giant No Shoes Nation Skull & Crossbones waving during “Pirate Flag” to Kenny Greenberg’s searing guitar solo on “Somewhere with You,” it was all surging energy and riotous applause. Bringing surprise guest Grace Potter in a black leather mini skirt out, he explained the day was special because “a couple days ago, I got to call Grace Potter and tell her not only are we playing Lambeau Field, we have a #1 record.” That set up the week’s chart-topping “Wild Child” as a sea of hand-lettered placards were thrust into the air. It was followed by a particularly heart-tugging “You And Tequila,” all whispered regret and desire. As “You And Tequila” faded, a 5-tiered cake was rolled from the wings down the T, along with a giant margarita. Chesney – the only concert to play Lambeau Field two times – then led the crowd of 53,363 strong through singing “Happy Birthday” to his frequent duet partner. Later in the set, Green Bay Packers head coach Mike McCarthy joined Chesney for the set closing celebration of high school heart and spirit “The Boys of Fall.” Signing a Packers helmet, McCarthy helped the East Tennessean give the special memento to a young girl. The only country artist in Billboard’s Top 10 Touring Acts of the Last 25 Years, Chesney’s been tearing up stadiums all summer. He’s broken his own record at Pittsburgh’s Heinz Field with 55,381, and prompted The Dallas Morning News to opine “Two parts Mick Jagger, one part Bruce Springsteen and one part Billy Graham” after his AT&T Stadium show.